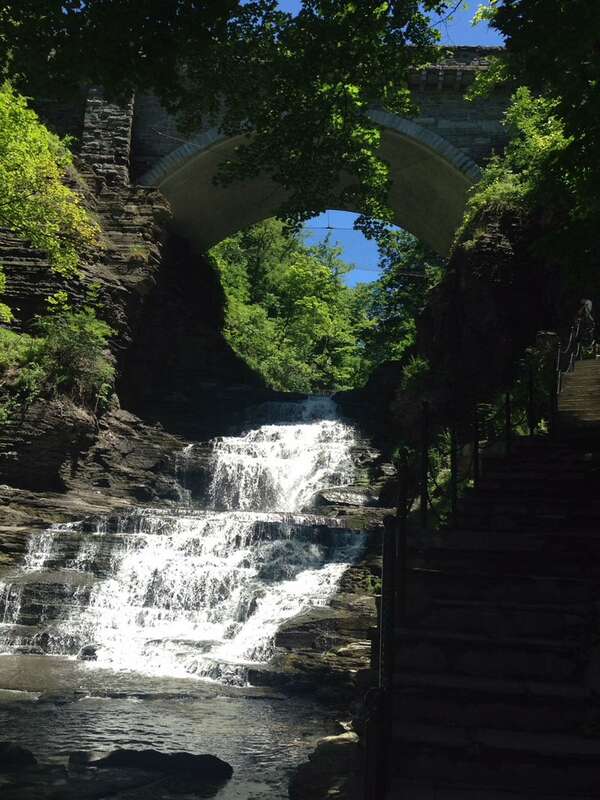 Readers reveal their favorite Finger Lakes destinations including Watkins Glen State Park, Sampson Naval and Air Force Museum, Glenn H. Curtiss Aviation Museum, free camping in Finger Lakes and Sugar Hill State Forests, and wineries, breweries, and distilleries galore! In 2013, Angela and I went on a truck camping adventure through New York’s Finger Lakes Region in a Northstar 8.5 Arrow U. Along the way we sampled a number of vineyards, visited the The Corning Museum of Glass, and explored Cornell University (pictured below). 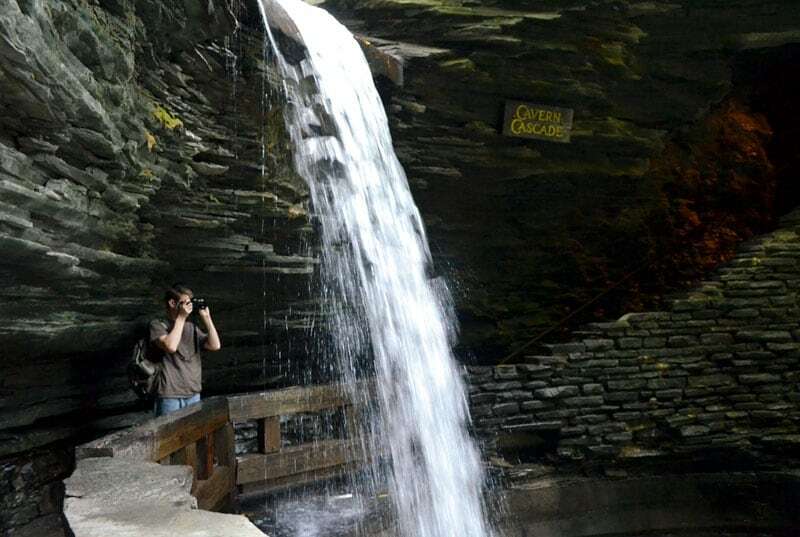 Of all of those experiences, by far our favorite part of that trip was the Gorge Trail in Watkins Glen State Park. The Gorge Trail is as unique and spectacular as anything we’ve seen throughout the United States and Canada. Carved out by glacial ice, the 400-foot deep gorge cuts through shale, limestone, and sandstone rock. 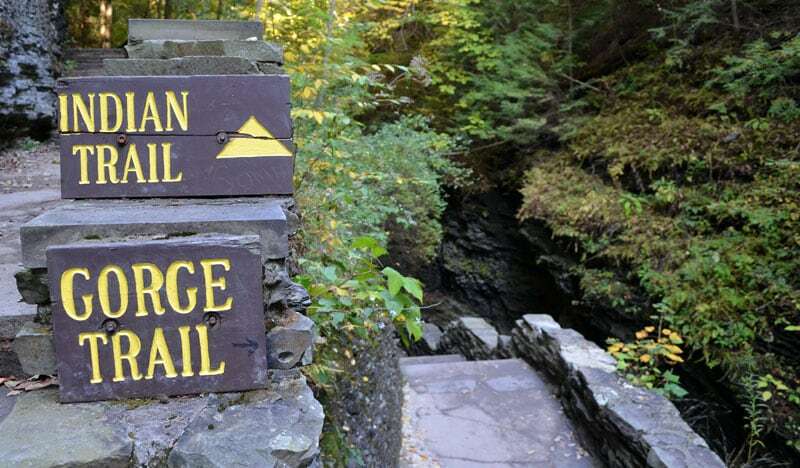 The trail traces the path of Glen Creek and takes you over and under stunning waterfalls, cascades, and plunge pools. At various times you can literally stand under a roaring waterfall just feet away. 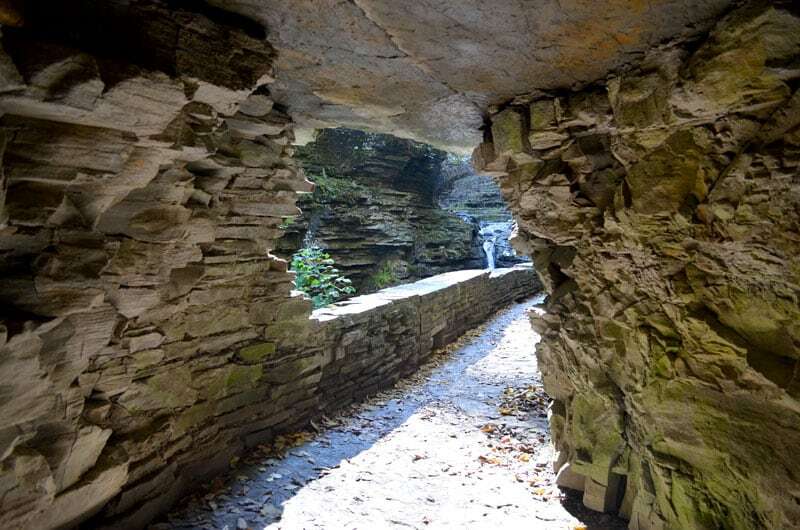 In other areas of the trail, you walk on a path carved into the side of the rock face overlooking the gorge and creek. Bridges take you over the gorge, and then create iconic photo opportunities. Just be careful not to get your camera wet! As a passionate photographer, I had a field day taking photographs in and around the Gorge Trail. We happened to be there in early October and the trees were starting to strut their fall colors. 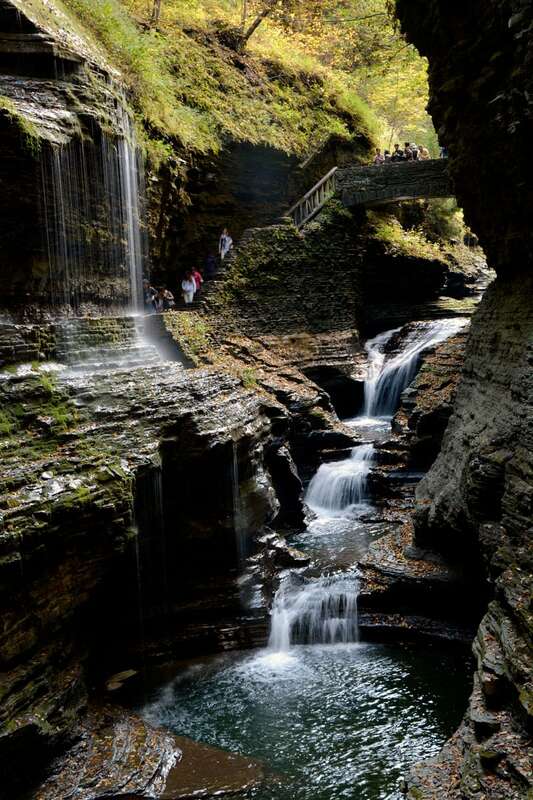 If you enjoy nature and photography, you’re going to love Watkins Glen. We camped for two days in the Watkins Glen State Park. The campground was clean and well presented with (water and electric) at the campsites. The nightly rate in 2018 is $18 without electric and $24 with electric. Online reservations are required. Watkins Glen State Park is “household pet” friendly but requires 6-foot or shorter leashes and written proof of rabies inoculation. From the Ithaca High School parking lot, I went on an amazing five to six-mile hike. I saw waterfalls, gorges, bridges, gardens, Cornell University, and downtown Ithaca. 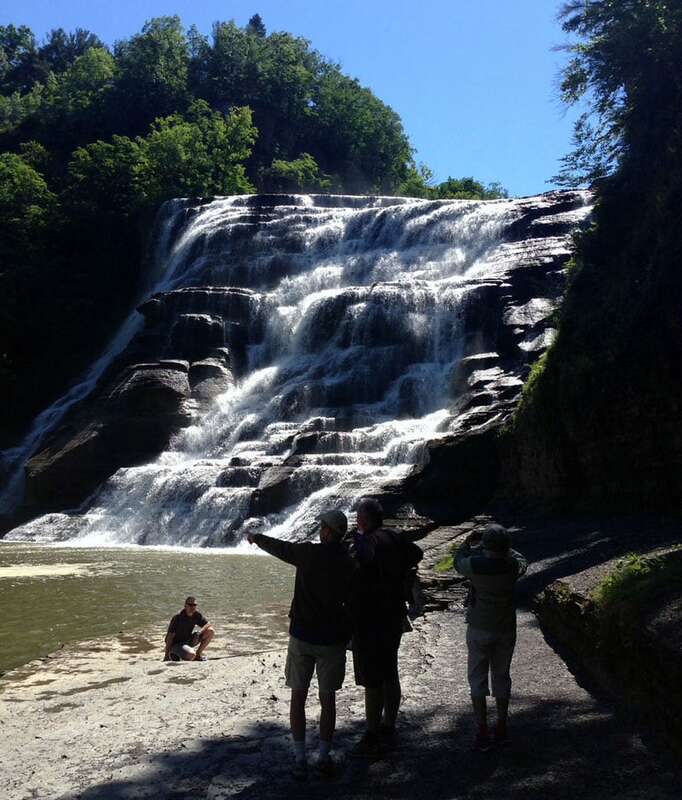 The first section of the hike went up Fall Creek to Ithaca Falls (pictured above) and Beebe Lake at Cornell University. On that hike there was approximately a 400-foot gain in elevation. 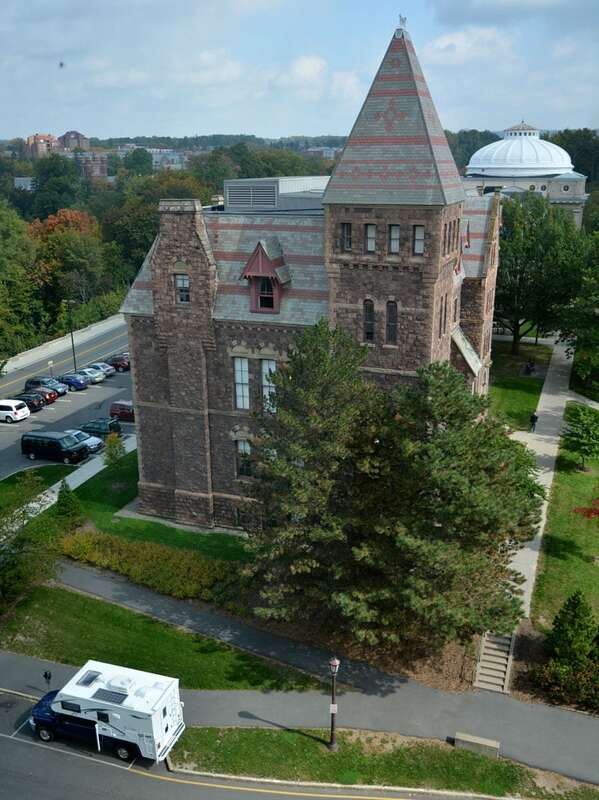 The second section was the Cornell Botanical Gardens just beyond the end of Beebe Lake, and then Cornell University. The third section was descending the Cascadilla Creek Gorge Trail with more waterfalls (pictured bel0w). That hike spanned from the south side of Cornell University to downtown Ithaca. The third section was Ithaca Commons with lots of restaurants, shops, and the Sagen Planet Walk. The Sagen Planet Walk is a three-quarter-mile scale model of our solar system. The Sagen Planet Walk was built as a memorial to Ithaca resident and astronomer Carl Sagen.